cariBBeing produces Carnival Panorama at Queens Museum of Art to supplement Caribbean: Crossworlds of the World exhibition. View photo set here. cariBBeing announces community/pop-up screenings in Partnership with historic Dutch Reformist Church on intersection of Church & Flatbush Avenues in the heart of NYC’s Caribbean community. 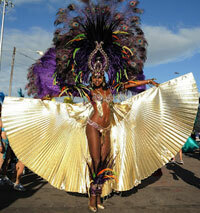 cariBBeing opens 2nd exhibition, Portraits of Carnival at MoCADA featuring photographers Ruddy Roye & Ray Llanos.